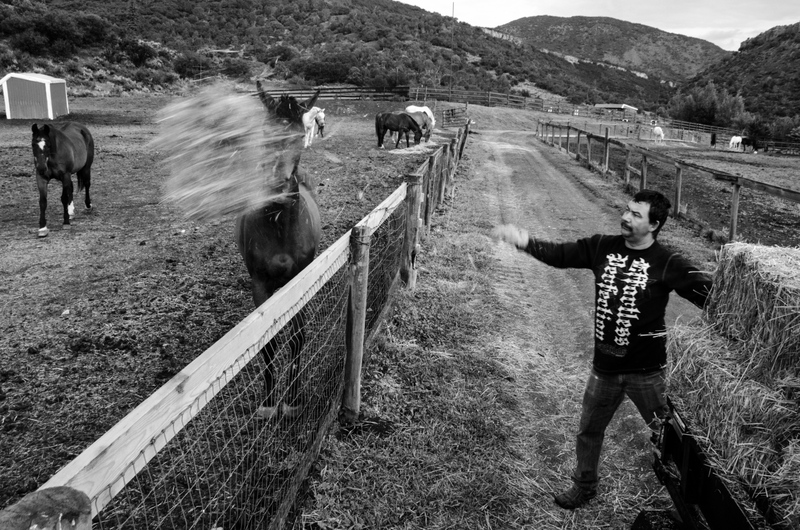 Juan Treviso, aged 44, feeds the miniature horses. You can still see their patriotic hairstyles from the 4th of July pony rides. Here, Juan is assisted by Gordo (the not-actually-fat shepherd) and Stuart (as Juan explained – “Little, like the mouse.”). 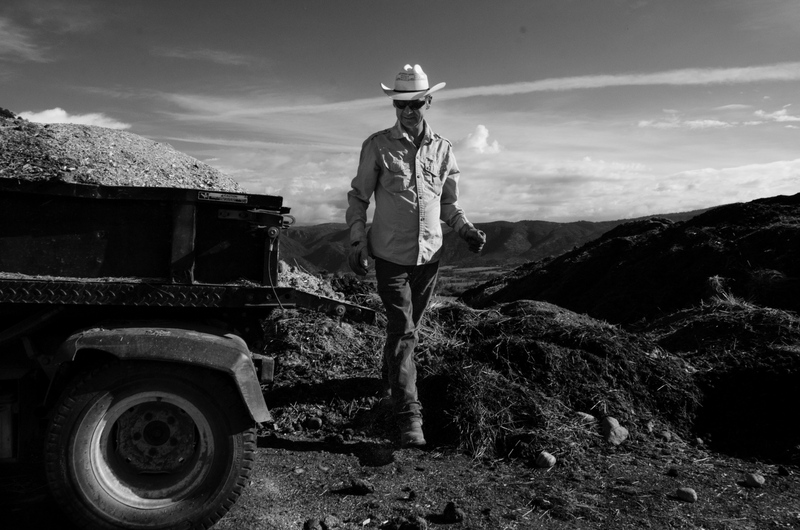 Juan is one of three ranch employees who live on site, with his son Luis, 19 years old. It takes a lot of hay to feed over 80 horses. 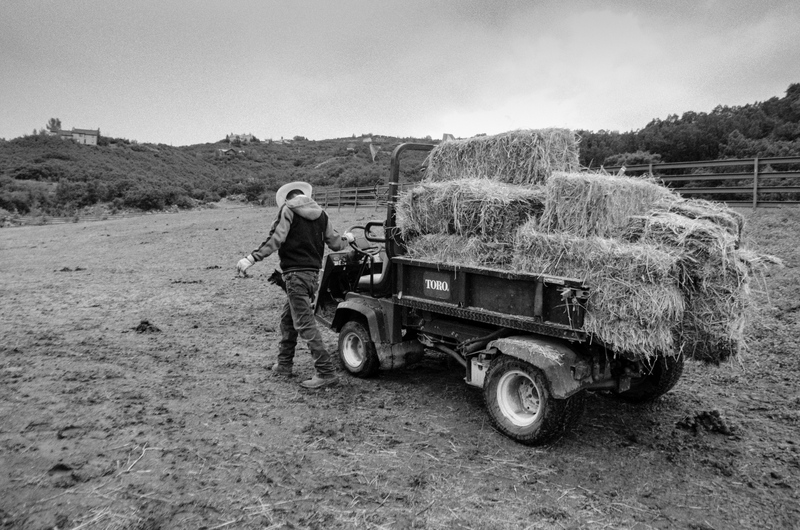 Juan is loading up the 4-wheeler to distribute to the outdoor, paddocked horses first, then moving in to the stalled horses. 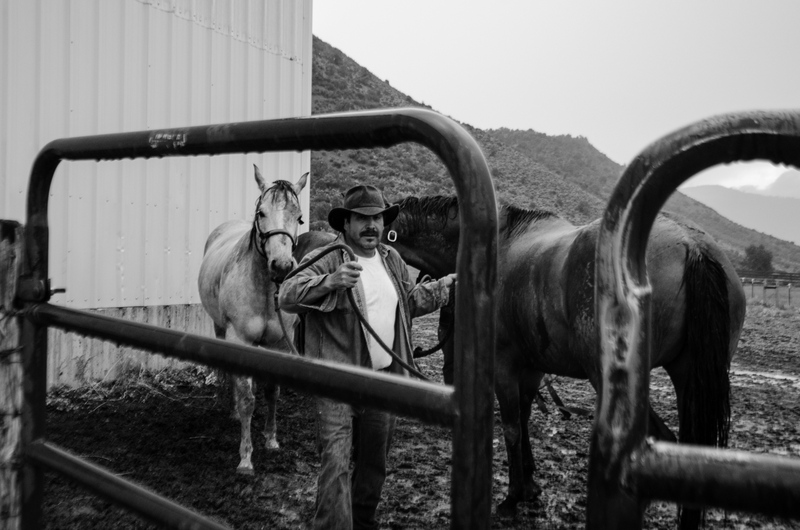 From Chihuahua, Mexico originally, Juan has returned to working with horses after being a landscaper for 14 years in Arizona. 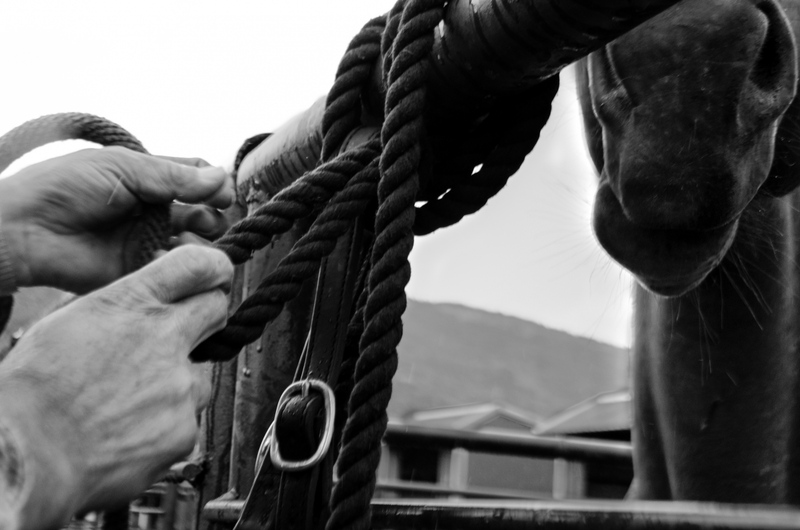 Jose Gutierez ties up a halter after bringing a horse in for his afternoon feeding. Previously a construction worker for 13 years, 52-year-old Jose, who had no previous equine experience, decided it was time for a change and has been with Cozy Point for the last two years. A rare moment with the three men together, as they are usually managing different parts of the ranch. Here, Jose Antonio Chapparo, 40 years old, (farthest right) is saying “Tengo hambre!” (“I am hungry!”), as the men normally eat breakfast after the morning feeding for the horses. Unfortunately, Juan tells Jose Antonio and Jose G., “Primos – necesitamos trabajar. Va a llovar.” (“Cousins – we need it work. It’s going to rain.”) The men, who are not actually related, are at the mercy of the weather and work straight on. This day, they didn’t get a break until early afternoon. Juan, escorted by Stuart, has a system when setting hay out in the pastures. He sets up the 4-wheeler on a low gear then climbs out and follows behind, spreading the hay. 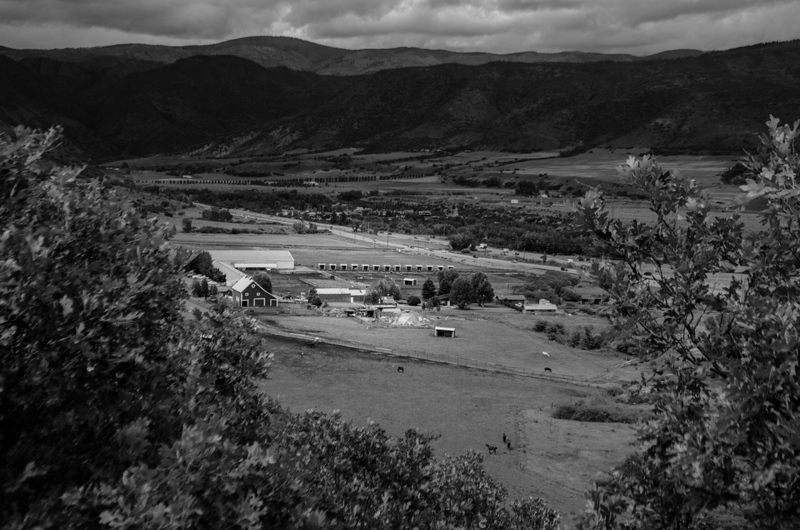 Up the hill from the ranch, amongst large, glamorous Aspen homes, I caught a glimpse of Cozy Point Ranch. This vantage point helps an outsider see the vast property these men manage, the homes in which they live, and the view they get to appreciate day after day. Jose G. leads in two horses for the afternoon feeding. It is not uncommon to see the men harness and lead up to five horses at a time. They are intimately familiar with the personalities of the over 80 horses. 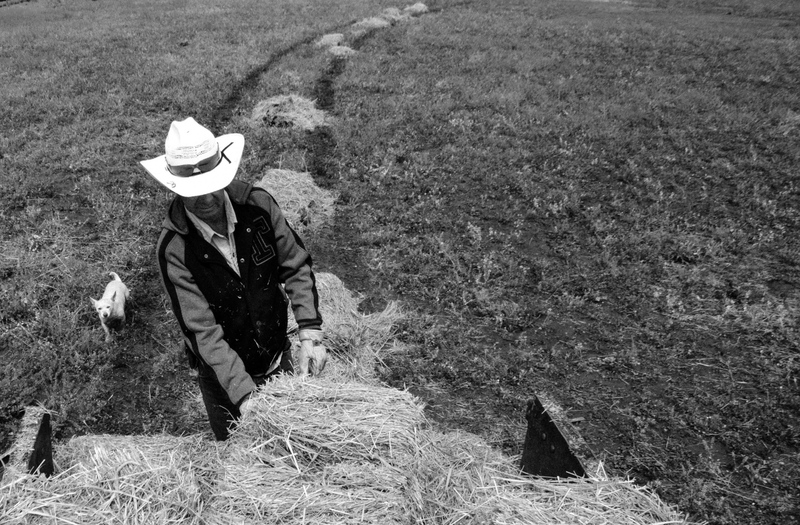 Juan spreads hay in another pasture. He set the truck to coast perfectly matched to his walking pace. 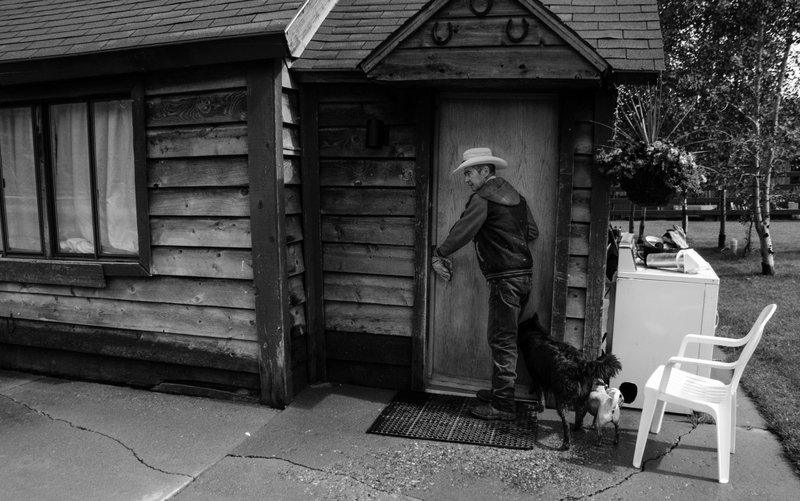 Patti Watson, the Cozy Point Ranch Manager, checks in with an owner of two horses due to arrive later that evening. Patti will be leaving shortly and Juan is in charge of setting up the paddocks for the two new arrivals. 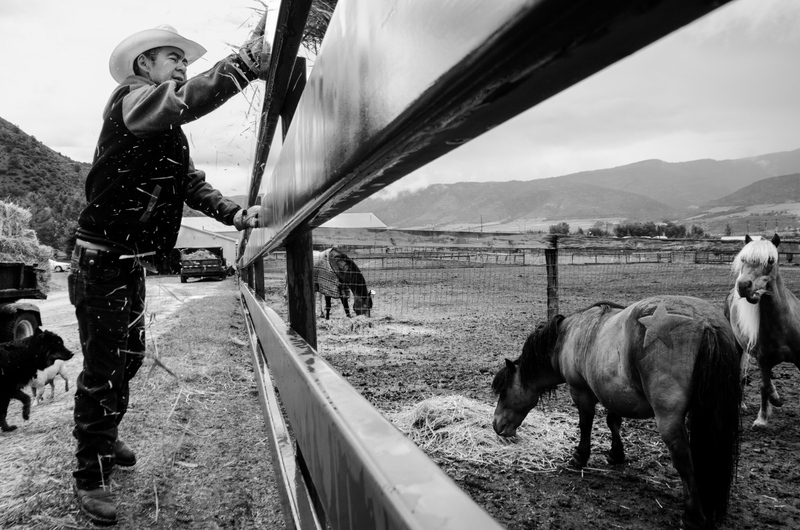 All new horses are quarantined for two weeks to ensure they adjust as smoothly as possible, without risking the health of the other horses at the ranch. 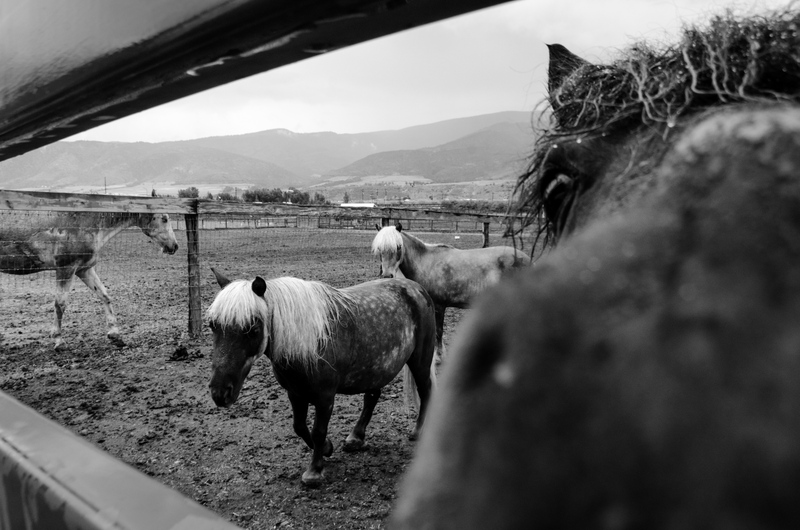 This playful miniature horse is curious as I shoot into his paddock at dinnertime. These details nicely show the range of tools needed as a ranch hand – work gloves, a pocket knife and an additional tool on the waist band. 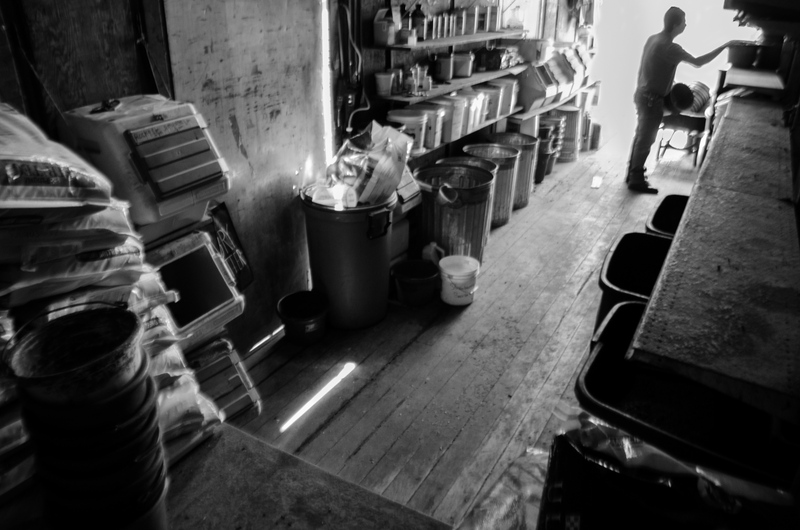 Jose G. multi-tasks, brining in feed buckets, along with two horses, as the pups wait under the awning. 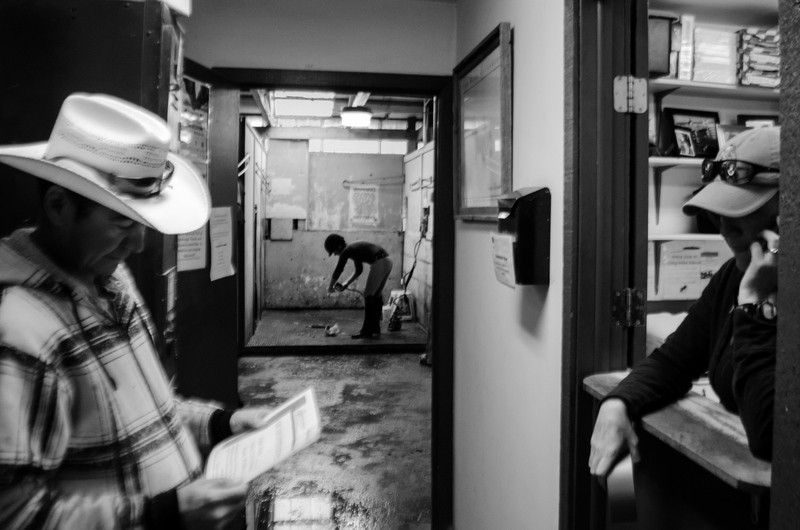 While the men can try to wait out the rain for a little while, ultimately, the jobs still need to be done, rain or shine. 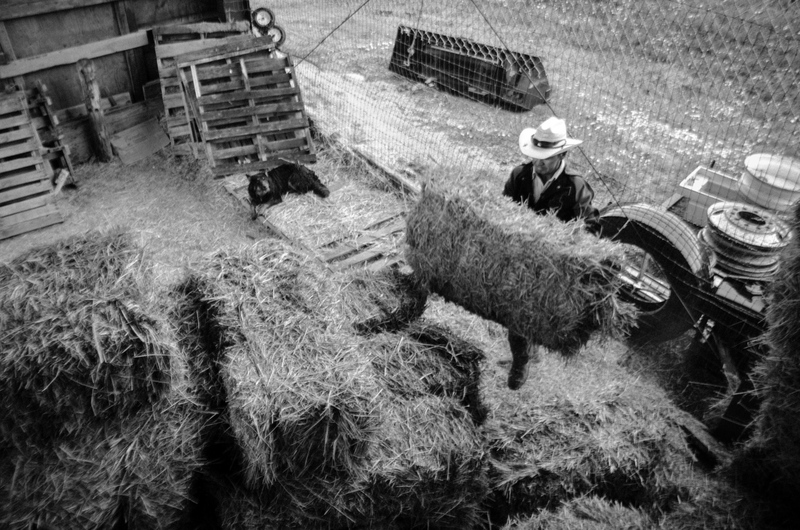 Jose Antonio distributes hay to another paddock on the property. It was interesting to view the pecking order amongst the horses on who gets first dibs, and who clears out when another arrives to eat. 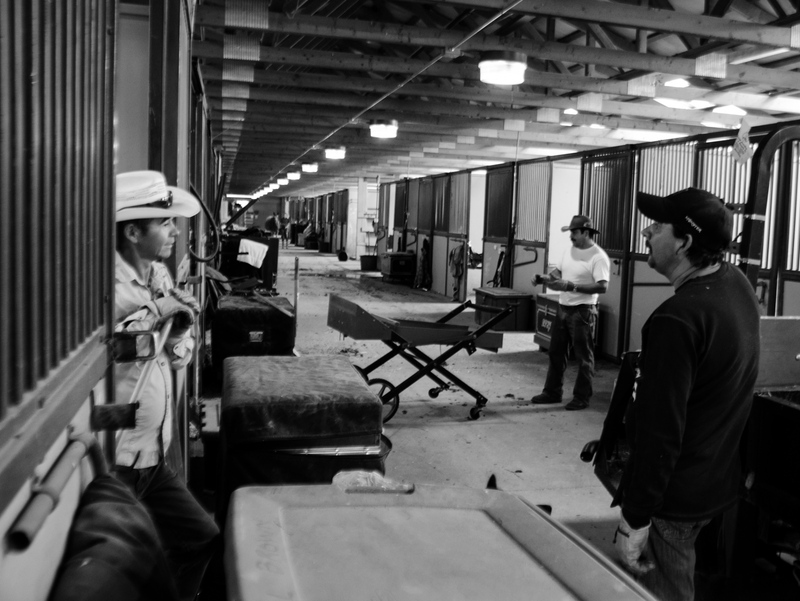 As Juan, Jose G. and Jose Antonio muck out stalls, they regularly bring the manure out to dump it in a pile. This majestic scene is one of the more charming parts of the job. Jose Antonio begins preparing the buckets to feed. Eventually the shelf to the right and to the lower left of the image will be covered, two or three rows in, with feed buckets. Each horse has a slightly different feeding plan, be it serving size, supplements or medications, which Jose Antonio has memorized. After a long day at work, Juan reaches his front door, which is about a 200-meter walk from the barn. Gordo and Stuart are return home to Juan’s other dogs or, as he calls them, “hijos de cuatro patas” (“children with four legs”), Kiwi and Fiona. After working all day at the ranch, Juan drives into Aspen to pick up his son, Luis, from his construction job. The two come home to happy dogs and a pot of leftover pasta. 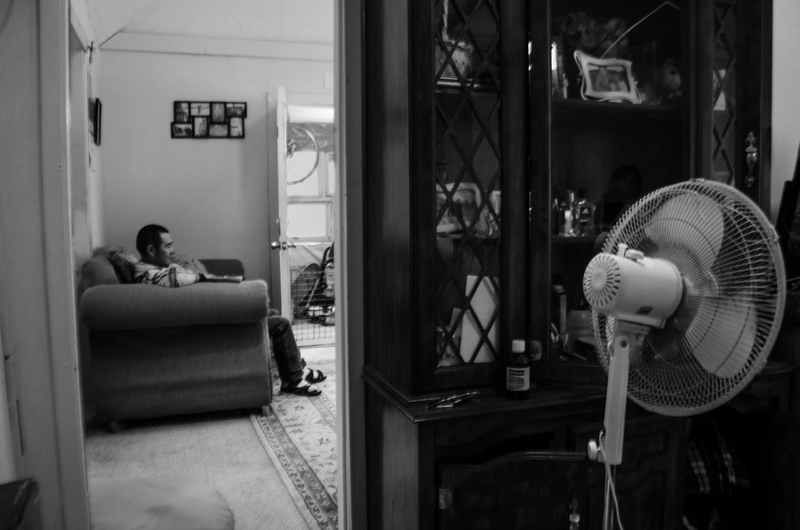 Luis’ mother lives in a neighboring town, but Juan has been Luis’ primary caregiver. The two have developed a strong bond of love and trust. Finally, after a long day, Juan takes a moment to himself. This hardworking man is always on call and will have to leave once more this evening when the new horses arrive. Such is the life of a ranch hand. Cozy Point Ranch has been a successful working ranch in Aspen for 120 years. Servicing boarding horses, hosting school equestrian teams and offering riding lessons daily, this ranch holds over 80 horses big and small, ranging from minis to some that are over 17 hands (1 hand = 4 inches) tall. They sponsor open space for the city and a small organic farm with produce and small animals, including chickens and goats. In this project, I immersed myself with three of the hard workers at Cozy Point Ranch, Jose Gutierez, Jose Antonio ‘Tony” Chapparo, and Juan Treviso. These men wake early, leave late, and are always on call. With Jose Antonio and Juan living at the ranch, sick or late-arriving horses can always be cared for. I witnessed the care it takes to manage these large yet fragile animals, from remembering 80 unique feeding regiments to skipping your own meals to ensure the horses are cared for in inclement weather. 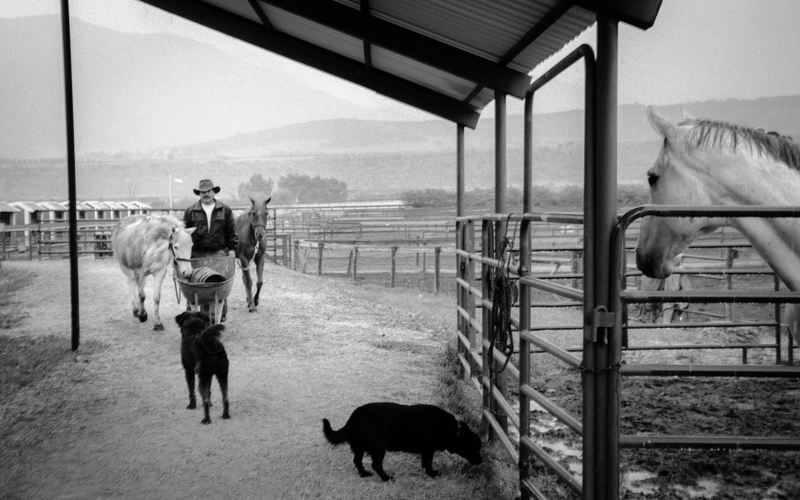 This project was completed in July, 2015 during a Digital Storytelling workshop with Ed Kashi and James Estrin at Anderson Ranch Arts Center.